Caste is a system of social status and hierarchy characterized not only by social rankings, wealth, and prestige, but also by hereditary occupations and endogamy. Members of a caste are supposed to marry within that caste, or occasionally with members of similarly situated castes. The canonical caste system is Jāti , from the Sanskrit for "birth" (जाति), which is associated with India and Hinduism. Similar social structures have existed in a number of societies, however, including Edo era Japan and various places in Latin America. Latin America is where the worde caste originated, from the Spanish and Portuguese casta , "lineage" or "breed". In Latin America elaborate classifications were made based on individuals' degree of European, African, and Native American blood. the Brahmins : priests, teachers and preachers. the Kshatriyas : rulers and warriors. the Vaishyas : agriculturists, herdsmen, merchants, and artisans. In the Hindu theology of reincarnation, the first three varnas are held to have been "twice born", meaning that those born into those groups must have spiritually progressed in their prior incarnations as human beings. Only members of the first three varnas are permitted to study the Vedas. The actual castes of India are much more elaborate than this fourfold theological division, and include multiple subgroupings that vary from one region to another. for a Dalit to enter the home of a higher caste person. Dalits suffer abiding discrimination in India, and inter-caste violence in India remains a problem there. A statute in India seeks to redress social problems caused by discrimination against Dalits, but enforcement has been only sporadic and discrimination within the legal system continues to exist. The Hindu caste system is nevertheless slowly succumbing to social change due to transportation and capitalism. Marriages outside the caste have increased, especially since the 1970s, a process which blurs the lineages upon which caste itself is founded. However, while marriages among different jati have increased, marriages outside the four varna remain relatively less common. The Roma or Gypsy people, especially in Eastern Europe. 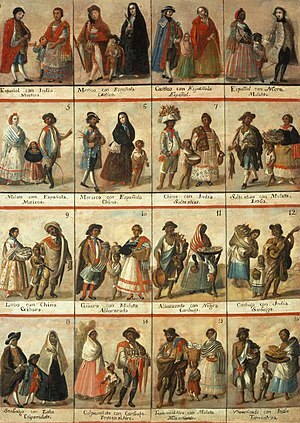 This 18th century Mexican painting illustrates the elaborate system of racial and hereditary classifications in use in Spanish Latin America. A comparably elaborate system of racial classification existed in Latin America. The Spanish and Portuguese colonists of the New World brought with them a pre-existing notion of limpieza de sangre , 'purity of blood', which they had already developed as a result of the Reconquista , the reconquest of the Iberian Peninsula from the Islamic Moors of Grenada and Andalusia. The concept of limpieza de sangre originally involved favoring purely European and Christian ancestry over descendants of African Moors and other disfavored groups including Jews. After the last Muslim state fell to Ferdinand and Isabella in 1492, the remaining Jews and Muslims were given the ultimatum to convert to Catholicism, leave, or die. Those who chose conversion faced abiding discrimination in Spanish society and their ancestors were often believed to practice Judaism or Islam in secret. The Latin American system, though it gave English the word caste, is not a true caste system, lacking the critical component of endogamy, marriage within the caste. Indeed, the system recognizes the inevitability of miscegenation, and is based on classifying people according to their numbers of European, African, and Native American ancestors. A similar system of describing people by the proportion of their European and African ancestry was also in play in much of the Caribbean and parts of the U.S. South, giving rise to racialized identities such as "quadroon" and "octoroon." ↑ Juergensmeyer, Mark (2006). The Oxford Handbook of Global Religions. Oxford University Press, USA. p. 27. ISBN 978-0-19972-761-2. ↑ Karen Leonard and Susan Weller, "Declining subcaste endogamy in India: the Hyderabad Kayasths, 1900 - 1975, American Ethnologist 7(3), August 1980. This page was last modified on 19 July 2017, at 15:38.